I looked around for a chair not too close to someone while I discreetly tuck the cover around the book. This was not a book you really want to be reading in public. Well I guess you can, but people may think you are kooky. 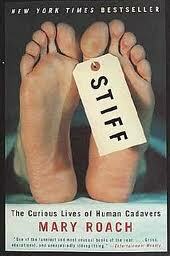 A book all about dead people…cadavers. I’m at my dentist’s office waiting for the nurse to call me back. My stomach is sickly, the way it usually feels when I come for a visit. I dread each time I go to the dentist. Yet I have to say I love my dentist. She is personable and good natured. Funny and kind. Someone I’d enjoy spending time with if I wasn’t stuck in a chair with a dental dam in my mouth, smelling the plastic scent of a drilled tooth with pooling saliva in the back of my throat. I hate being in a comprising position, forced to endure any surprise that may be lurking about. And silly me I choose to read this book, about dead people while I wait to meet my dreaded fate. The book is not helping my nerves. I read in repulsion of decapitated heads and how cosmetic surgeons test their skills on innocent stiffs. Gruesome details are exposed and I can now taste the acid in the back of my throat. I pause for a break and pretend to tie my shoes to gain some blood back into my head. Pull it together…please don’t let me loose my cookies right here right now. Eventually the nurse calls my name and I’m led to the room of doom. I sit down in the chair like a good girl and met the dentist. She spies the book and asks what I am reading. (she’s so very friendly). I sheepishly show her the cover. “I remember practicing on cadavers” she tells me, in a positive tone. Ugh I don’t want to think about it! Visiting my dentist is how I equate this book. I like the author (much like I enjoy my dentist), her humor and her inquisitive nature. She informs me about things I’ve never thought about. While Roach uncovers mysteries like how long it takes a human corpse to liquefy, my dentist solves the mystery of why my tooth is sensitive. But this book becomes a pesky cavity in my life. Something that I keep reading with both eyes shielded by my hand, but I need to peek because I just can’t help it. I need to know what’s coming next. I can’t close my eyes in the dentist’s chair because somehow keeping my eyes open makes me feel more in control. I keep reading the book. Each chapter, each historic account, each investigative project is both revealing and disgusting. I often chuckle to myself because Roach is often so funny and likeable but it’s an uncomfortable laugh, because I don’t know what she’ll uncover next. Reading the book is as irritating as frigid ice cream on a sensitive tooth and the flashbacks continue to zap my system even when I’m not reading. The good news? I finish the book in time for book club. My body sighs with relief. It wasn’t so bad I guess. It was a lot like the dentist visit. I’m simply thankful I’m not dead yet.